Dusk Till Dawn was the venue for the sixth and final stop on the 2013 Sky Poker Tour with a total of a 204 hopefuls heading to the Midlands for the £330 buy-in event. After two days of hard fought action it was Mark Chantler who was celebrating. The man from Cheshire scooped the title and with it a first prize of almost £15,000 for his efforts at the Nottingham venue. After Matthew Simpson was eliminated in third place Chantler and Chris Canadine agreed a chop that saw the former guaranteed £13,985 and the latter £12,985 with £1,000, the trophy and the first place listing on the Hendon Mob database still to play for. With the pressure lifted the rail could have been forgiven for expecting a quick finish but the pair battled it out an hour before Chantler ground his way to the title. The final had saw Canadine take a stand with K-9 which couldn't come from behind to beat the Chantler's pocket tens. 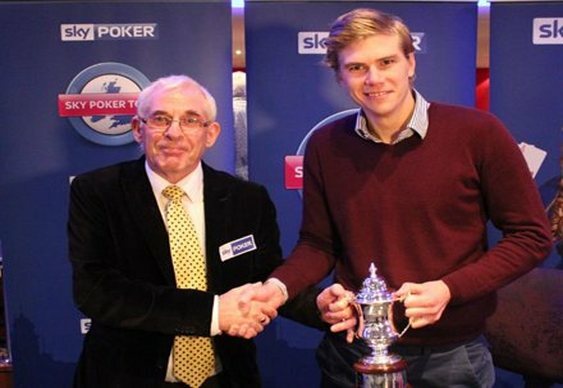 That wraps things up for the Sky Poker Tour for 2013. There's plenty of online action to enjoy at the Sky Poker Tour tables though with the latest incarnation of its popular UKOPS tournament festival up and running. A total of £250,000 in prize money is guaranteed between now and 3 November in 30 events. There is something to suit all bankrolls including deep stacks and turbos, freezeouts and rebuys, and a £25,000 High Roller event. The series culminates in a £110 buy-in, £40,000 guaranteed Main Event at 8pm on Sunday 3 November. The full schedule is available at Sky Poker's UKOPS page. New players signing up at Sky Poker via Bluff Europe can enjoy a 200% first deposit bonus up to £500 as well as a free £20 and entry into freerolls worth £1,500.